Indonesian Prawn Curry 印尼咖喱虾 does not refer to the origin of the seafood but rather the taste. This is a very popular dish in Malaysia which I am eager to recreate in my kitchen. 1 small or ½ a big Red Onion, cut into wedges. ½ thumb-size fresh Turmeric (Yellow Ginger) or ½ teaspoon Turmeric Powder. 2 Candlenuts (buah keras in Malay or kemiri in Indonesian). 1 teaspoon Belacan (terasi in Indonesian or shrimp paste in English). 1 tablespoon Indian Meat Curry Powder. 2 Lemongrass, white part only, bruised. 2 stalks Curry Leaves, stripped from stalks. 200ml Evaporated Milk, more or less to taste. Chicken Stock Granules, to taste or use Salt instead (or both). Blend shallots, garlic, chillies, turmeric, candlenut, and belacan together in a food processor until they become a fine paste. This is the rempah or spice mixture. Heat wok or claypot with a teaspoon of oil and toss in the onion wedges until some parts are browned and onions are translucent yet retain crunchiness. Set aside for later use. Add 2 tablespoons oil and fry the spice mixture and lemongrass until glistening and fragrant over medium heat. Add curry powder and half the curry leaves and fry until oil surfaces. Add up to 250ml water and turn up the heat to bring to a fast boil then lower heat and let it simmer for 5 minutes. Season with chicken stock granules or salt to taste. 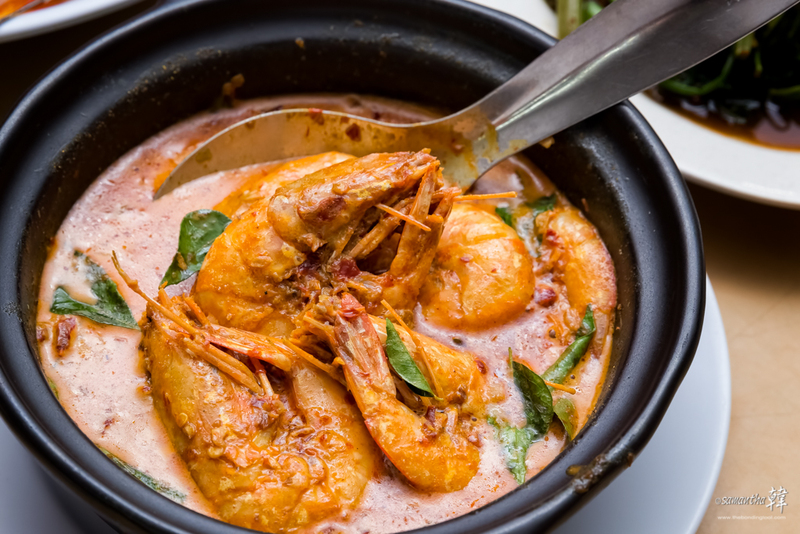 Turn up the heat and bring gravy to a rolling boil before adding prawns, boil until prawns are almost cooked through (cooking prawns over high heat helps to keep its firm texture). Reduce heat before adding evaporated milk (to prevent curdling) to the gravy consistency you like. Taste and adjust final seasoning (chicken stock granules or salt). Add the fried onion wedges and curry leaves and give it a few quick stirs. Turn off heat and serve with steamed rice. I prefer Carnation Brand full cream evaporated milk over other brands as I find it more flavoursome. You may substitute evaporated milk with coconut milk/cream (to taste). You may substitute prawns with crabs or mussels on half shell. You may add vegetables i.e. ladies fingers (okra) French or long beans if desired.